Field Operations acquires and cultivates volunteers and donors through grassroots fundraising events to support the life-saving mission of St. Jude. Thirteen regions conduct thousands of events each year, including radio-thons, Dream Home campaigns, galas, pin-up promotions, college fundraisers, golf tournaments, and fitness programs. In collaboration with the other development divisions, Field Operations empowers fundraising ambassadors in communities across the country. Departments in Field Operations include the following: Radio Marketing, Dream Home Marketing, National Program Marketing, Operations & Budget, and regional offices throughout the country and Puerto Rico. Give thanks for the healthy children in your life and give to those that are not. Make Some Extra Holiday $$$! With the holidays just around the corner, I’m going to show you how you can make up to $180 per day and get paid in cash DAILY! You can start today and you can get paid tomorrow! The call will be fast … the same way we make our money! It will only take 10 minutes for you to hear what we do and how we do it! If you like what you hear, shoot me a message saying, “I WANT IN” and I’ll immediately send you a message with next steps. You can literally start today and begin earning tomorrow…yes, money in your PayPal account TOMORROW. You hold the key. 1) At least 18 years of age|2) Live in the U.S., Canada or the U.K.| 3) Have a computer with Internet access (a smartphone will work). You will also be required to make a one-time investment of up to $50.00. 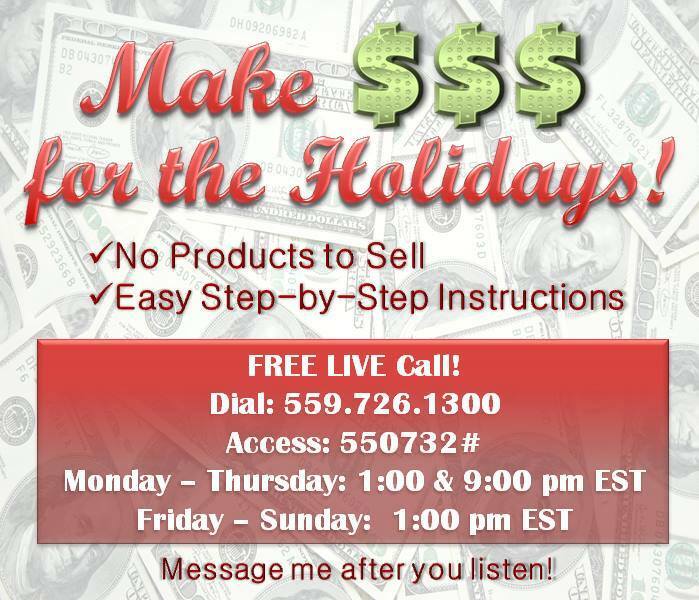 Listen to the call then shoot me an email at teciamarshall@gmail.com and let me know that you’re ready to get started!